There is more opportunity today than during any time in history to find all the pieces of information you could possibly need to make solid investment decisions. However, with so many newsletters, books, videos, courses, tools and other resources out there, it can sometimes become a little overwhelming and confusing. I figured it would be a good idea to put together a list of helpful resources that you can come back to regularly for your value investing needs. I'll add more resources over time, so I strongly recommend bookmarking it (hit Ctrl+D now!) for easy access in the future. Disclaimer: some of the links below are affiliate links. This means that if you decide to make a purchase through them, I might earn a small commission. However, please note that I only list resources here that I have personal experience with and which I believe to be truly helpful. That’s why I’m listing them here for you! Enjoy. If you look at nothing else on this page, these are the resources that you should know about. Interactive Brokers: In order to buy stocks you need a brokerage account, and there is probably no better broker available than Interactive Brokers. Barron's actually rated them #1 broker for three consecutive years. Great service, low fees. GuruFocus: This website is absolutely amazing! They have several powerful stock screeners, insightful newsletters, and, something which I personally find very interesting, you can see what stocks the "gurus" are buying. Check it out. Buffettology: After reading dozens of books on investing, this book is by far my favourite! In the book, intricate details of Warren Buffett's ingenious investment strategy are revealed which no other book seems to cover. I highly recommend it! Investopedia: Whenever you need a clear, to-the-point explanations of a concept related to investing, there is a big chance you can find your answer on Investopedia. A great resource for the beginner, but I still use it all the time. 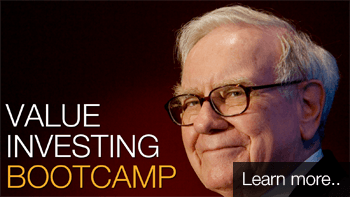 Value Investing Bootcamp: This overcomplete online investment course, created by yours truly, contains three hours of quality video content which takes you from a beginner to an investment pro in just a couple of hours! The Intelligent Investor: Benjamin Graham is the so called "Father of Value Investing", and mentor of superinvestor Warren Buffett. Everyone who is active on the stock market should read this monumental work which has inspired many of the great investors of our time. The Superinvestors of Graham-and-Doddsville: This groundbreaking article written by Warren Buffett himself sweeps the floor with the Efficient Market Hypothesis (EMH) and explains the effectiveness of his value investing approach. Rich Dad, Poor Dad: Every high school should make this book mandatory reading. Rober Kiyosaki explains in clear words how money works, why the rich get richer, why most people are doomed to struggle financially all their lives and what you can do about it. Financial Statements: Many people find financial statements boring, but they are an essential part of the value investing toolkit. In this book Thomas Ittelson manages to explain in a clear, practical way how to read financial statements and use them in your analyses. Wordly Wisdom by Charlie Munger: Buffett's witty and highly intelligent business partner, Charlie Munger, held a powerful speech in 1995 in which he explained some "thinking models", or ways of thinking, that helped him succeed in life. This is stuff you should know. Warren Buffett's Letters to Berkshire Shareholders: This is a true treasure trove of wise words straight from the mouth of the world's best investor. These letters written by Warren Buffett to the shareholders of his investment firm Berkshire Hathaway are mandatory reading for investors. 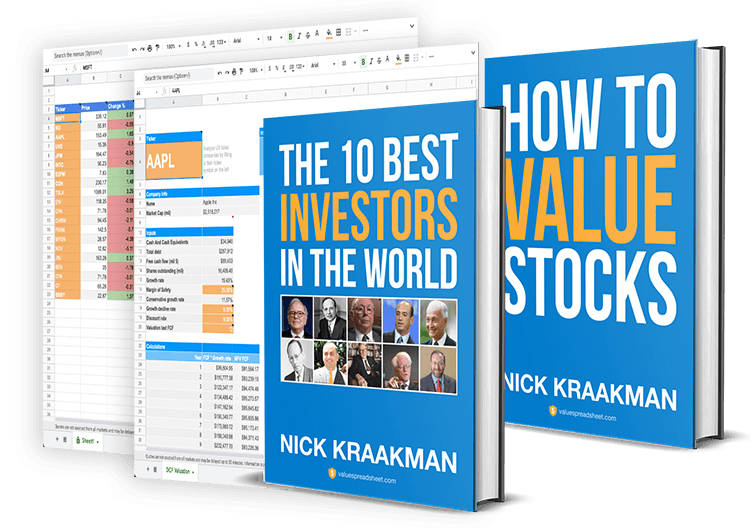 How to Value Stocks ebook: Valuing stocks is an integral part of the value investing philosophy, but it took me quite a while to figure out how to do this exactly. So to make your life a bit easier I decided to write a free ebook in which I describe three valuation models in a practical way so you can start using them immediately. The Essays of Warren Buffett: If reading through all of Buffett's letters is a bit too much for you, then this magnificent book by Lawrence A. Cunningham manages to capture the full breadth of Warren Buffett's wisdom. Cunningham's book is invaluable for serious investors and managers around the world. The Dhandho Investor: The Dhandho Investor written by Mohnish Pabrai was the very first book I ever read on the subject of value investing, and it was an eye-opening experience. I highly recommend it, especially if you are relatively new to the world of value investing. Value Investing Bootcamp Podcast: This limited edition podcast covers many topics related to value investing in bite size episodes of around 10 minutes each. Money Tree Investing Podcast: Interviews with guest from all sectors of the financial industry on a broad range of topics, like dividend investing, index funds, options, trading, and more. Value Investing Podcast: Insightful interviews with thought-leading value investors. Very interesting content from high-profile guests. There are innumerable amazing blogs out there with a value investing approach, and I should probably follow more of them. The reason why the following list is extremely short is because for me the best way to stick to my investment strategy and not get caught up in market hype or pessimism is to largely block out news and opinions from other investors and rely more on my own due diligence. Still, here are a couple of valuable websites which have taught me a lot. SeekingAlpha: The quality of articles on SeekingAlpha is impressive to say the least. Anyone can register on the site and post articles, but their monetary incentive system pushes authors to really give it their best. You can subscribe to receive articles related to certain stocks, which can be useful to stay on top of your portfolio holdings. CSinvesting: This blog stands out for me because it takes a different approach to teaching about investing, namely a case study approach. Many of the articles are answers to reader questions and include links to useful resources with additional information. Shares and Stockmarkets: While this blog is mainly focused on the UK stock market, the author, David Thomas, has made a lot of solid information available which applies everywhere. Definitely check this one out. Value Spreadsheet: While I don't read many blogs, I do write one. My aim is to provide objective information about topics related to value investing. I do not cover individual stocks like most blogs do, because I believe that facts are more important than opinions. Google Finance: I love everything Google does, and their finance website is no different. You can get several years of historical financial statement data here, the price chart works really smoothly and incorporates news items in it, and the pièce de résistance is their free virtual stock portfolio which I use to track my current holdings, use as a watchlist for interesting stocks, and to test out new strategies without risking any real money. GuruFocus: Ok, so four years of data isn't enough for you? Then check out GuruFocus, which offers an amazing 10 years of financial statement data for free! In addition it lists all kinds of ratios which are of special interest to value investors, like the Altman Z score and a Peter Lynch chart. Yahoo Finance: Another great source for financial data, but the thing that sets it apart from the other websites is that it lists analyst earnings and growth estimates. While these estimates should always be taken with a grain of salt (or several), they do provide at least some rough indication of how a company is expected to perform by the "experts". The Motley Fool CAPS: While the articles written on the Motley Fool are often short in content and long in sales talk, I do love their CAPS community where individual investors can say if they believe a stock will outperform or underperform and, the thing I find most valuable, provide a short written explanation of why they think that's the case. Before I make an investment I always check the commentary of the CAPS community, and while I do not let their opinions guide me, it has prevented me from making some big mistakes because some investor's comment included vital information I had overlooked before. Morningstar: One of the most respected websites for accurate financial data. Also offers stock ratings, research reports, market news and much more. I particularly like their premium stock screener, which you can try for free for 14 days. 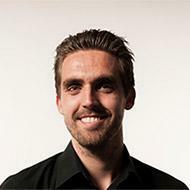 Jitta: I'm really impressed by this up-and-coming, value-oriented investment tool and expect it to become one of the biggest in the business once development is finished. Google Finance: A completely free stock screener with an easy interface to filter out the good from the bad. Yahoo Finance: Yahoo offers a basic online screener as well as an advanced Java based screener. Both are free. Fool.com: The Motley Fool stock screener is unique, because you can filter based on how well the members of their CAPS community think the stocks will perform. FINVIZ: A popular free stock screener which I haven't used myself, but it seems to offer all the features you might need. CNBC: This free stock screener allows you to incorporate analyst estimates and interesting financial ratios, like asset turnover and quick ratio. Value Spreadsheet PREMIUM: This is it. You have arrived. The investment tool to end all investment tools. Just kidding. This is the fully automated investment spreadsheet I have continuously refined over the past years based on studying the strategies of the world's best investors in combination with personal experience on the stock market. It started out as a project to improve and speed up my own investment decisions. Value Spreadsheet allowed me to analyze and value stocks in one click, reducing the time to research a stock from hours to seconds. Where most tools just present you a mountain of financial data, Value Spreadsheet goes one step further and actually interprets the data for you. After I used this spreadsheet successfully for a couple of years I decided that other people might benefit from it as well. That's when I started the Value Spreadsheet website. I am proud of this product and I truly believe it can help you make better investment decisions, and make them faster! OldSchoolValue: It would be unfair not to include this link, even though the OldSchoolValue (OSV) spreadsheet is a direct competitor. The creator of this tool, Jae Jun, has done a great job creating a powerful spreadsheet with functionality similar to Value Spreadsheet PREMIUM. The difference is that Jae's tool uses Excel, which only works on Windows and requires you to install several plugins, while Value Spreadsheet uses Google Spreadsheets, which works on all devices with an internet connection and does not require you to install anything. The OSV spreadsheet is a very complete tool which offers a tremendous amount of valuable information. However, the the downside of this is that it makes the tool fairly complex, which is why I tried to make the Value Spreadsheet dashboard as clean and clear as possible. All in all, a great tool, but it comes with a learning curve and a Windows-only limitation. TradingView: This brand-new, high-tech financial platform allows you to create advanced graphs which were previously only available to institutional investors. Now you have the same functionality in the palm of your hands, since TradingView was created from the ground up as a mobile-ready platform. So why do I list a charting website as a value investing resource? Only technical analysts use charts, right? True, until now! TradingView has done something really awesome: besides offering countless technical indicators, they allow you to plot fundamental data as well! Now you can visualize fundamental data in a way the investment world has never seen before, allowing you to get a better picture of the companies you are analyzing! You can also view several charts side-by-side and easily embed them in your website or blog. Pretty cool stuff if you ask me. Do you have any recommendations for resources that should be added to the list? Let me know in the comments below!